One of the objectives of the project is the development and characterisation of cognitive design patterns (CDP), that is, reusable solutions to engineer distributed systems with cognitive processing abilities. In this context, we are working toward the definition of a CDP for collective decision-making, inspired by the nest-site selection of honeybees. In honeybee colonies, after spring reproduction, several thousands bees leave their hive and create a cluster in the neighbourhood lasting a few days. During this time, the oldest bees in the swarm search for new nest sites and, once they discover one, get committed to it. On the one hand, committed bees have a certain tendency to spontaneously abandon their commitment. On the other hand, by interacting with other bees through the waggle-dance, committed bees recruit uncommitted nest-mates to the site they have discovered. The waggle-dance duration is proportional to the quality of the advertised nest, and through this form of positive feedback a greater number of bees gets committed to the best quality nests. Recently, it has been discovered that bees committed to different alternatives cross-inhibit each other through stop signals. A bee committed to a site that receives several stop signals abandons its commitment and becomes uncommitted. 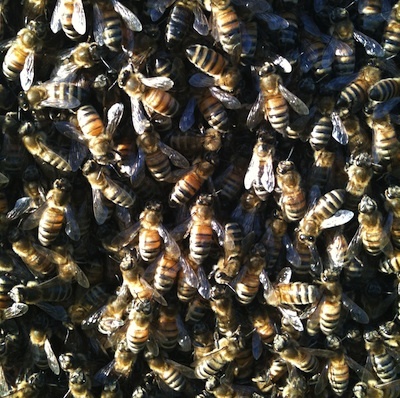 Eventually, the entire colony reaches consensus on a single site where to swarm. This mechanism allows to break decision deadlocks in case of equal-best alternatives. In this way, the colony minimizes the decision time, thus exposure to dangers such as predation or adverse weather conditions. We are developing a CDP that starts from theoretical models of the above decision-making process, and provides a link between microscopic (i.e., related to the individual agent behaviour) and macroscopic descriptions (i.e., related to the system as a whole). The CDP is corroborated by examples that show its application in various domains (e.g., swarm foraging scenarios). Consensus dynamics in decentralised multiagent systems are subject to intense studies, and several different models have been proposed and analyzed. Among these, the naming game stands out for its simplicity and applicability to a wide range of phenomena and applications, from semiotics to engineering. Despite the wide range of studies available, the implementation of theoretical models in real distributed systems is not always straightforward, as the physical platform imposes several constraints that may have a bearing on the consensus dynamics. In this research, we investigate the effects of an implementation of the naming game for the kilobot robotic platform, in which we consider concurrent execution of games and physical interferences. Consensus dynamics are analysed in the light of the continuously evolving communication network created by the robots, highlighting how the different regimes crucially depend on the robot density and on their ability to spread widely in the experimental arena. We find that physical interferences reduce the benefits resulting from robot mobility in terms of consensus time, but also result in lower cognitive load for individual agents. Random walks represent fundamental search strategies for both animal and robots, especially when there are no environmental cues that can drive motion, or when the cognitive abilities of the searching agent do not support complex localisation and mapping behaviours. In swarm robotics, random walks are basic building blocks for the individual behaviour and support the emergent collective pattern. However, there has been limited account for the correct parameterisation to be used in different search scenarios, and the relationship between search efficiency and information transfer within the swarm has been often overlooked. In this research, we analyse the efficiency of random walk patterns for a swarm of Kilobots searching a static target in two different environmental conditions entailing a bounded or an open space. We study the search efficiency and the ability to spread information within the swarm through abstract simulations and real robot experiments, and we determine what kind of random walk best fits each experimental scenario. See the publications page for more details.